As you know, we welcomed our incoming Kindergarten students and their parents to Ridgeview this week. Christy and I were out of our classrooms to help facilitate some of the learning centres. This year we decided to host a parent information evening for new Kindergarten parents, and Welcome to Kindergarten sessions for the children over two mornings. 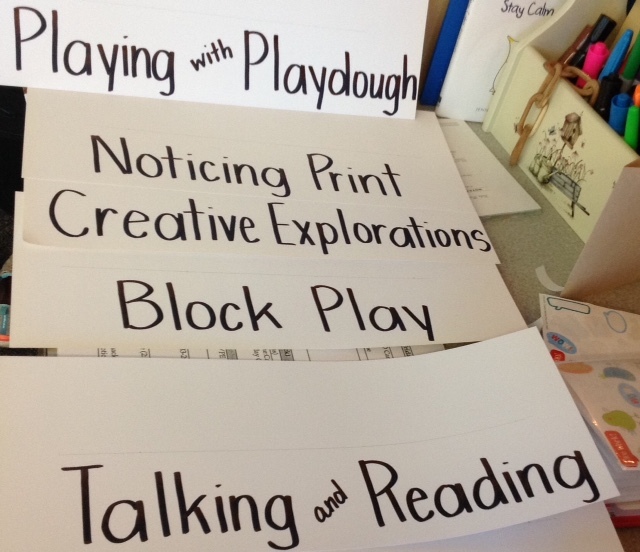 We’ve been running this program, with The Learning Partnership, for many years now and were excited to add Block Play to our Creative Explorations, Noticing Print, Playing with Playdough and Talking and Reading Activities. When we returned to our classrooms after each of the sessions, we were caught off guard. Our Kindergarten students seemed so…grown-up…mature…and ready for Grade One! It’s been about a year now, that we first met our current students at their Welcome to Kindergarten day. The time has certainly flown by, and how quickly children change in a single year. Although all students show growth each year they progress through school, the changes we see in Kindergarten are quite profound, as we see the children move away from being egocentric to thinking about and considering others, more reflective in their thoughts and speech and glowing with confidence in their abilities, knowledge and self-regulation. We’re getting that teary feeling thinking about our little people moving on so we better stop, be mindful of the moment and this wonderful time we’re having together at school enjoying each other’s company, utilizing and applying the skills they’ve acquired, deepening our learning. This was a big week, not just because of the WTK, but we finished our Alphabet Books! We finished the letter Z, so now we will take a few days to get caught up on some of the pages we might have missed. We will send these books home soon for a special Kindergarten keepsake. Speaking of finishing, we’ve come to the end of number concepts to 10 with reading a great little book, 10 Black Dots by Donald Crew. We used the story frame to make our own big book by creating individual pages, designing with as many dots as each child wished. We love how the children chose to use their black dots, and you’ll be able to read their big book when you and your child attend Student Led Conferences. 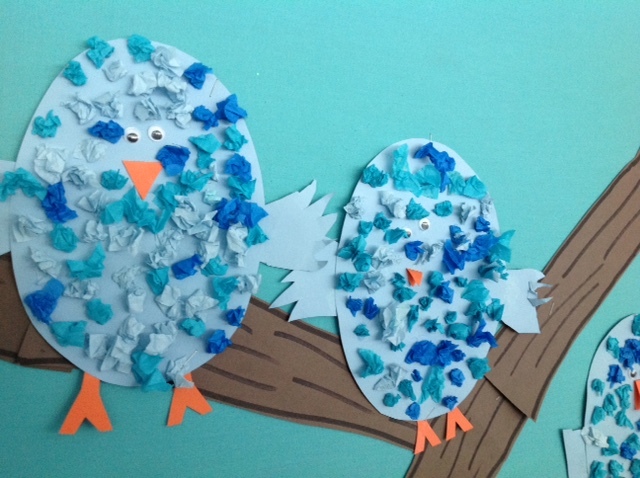 We made these cutie robins with our Grade 7 Buddies this week, and still on the spring bird theme, we made our sweet blue chicks. 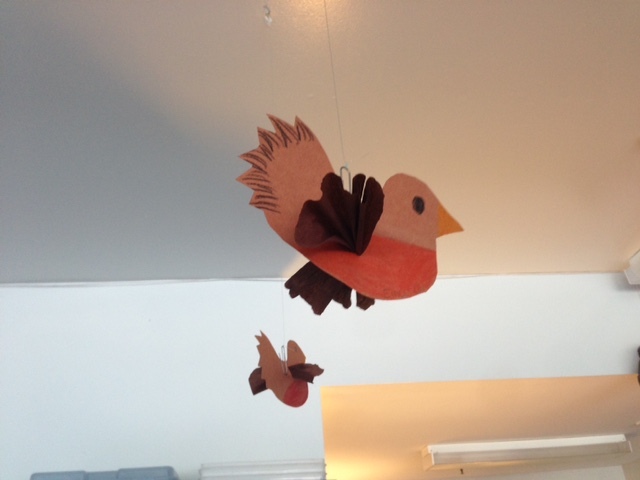 We love the blue chicks, decorated with crushed light blue tissue squares, as it’s a craft which requires perseverance to finish, yet is repetitive enough to allow us to chat with our neighbours like a quilting or knitting bee, and strengthens our fine motor skills for printing. We’ve started our study of Plants, with a spring time walk and comparison discussion of living and non-living things. We talked about how living things require food to grow and can look like their parents as they grow up. This week we read “The Garden” from Frog and Toad are Friends as part of our inquiry into a plant’s needs. We learned that soil, water, air, time and love are necessary for plant growth. There will be an early dismissal on Wednesday, May 4, at 1:50 pm for Student-Led Conferences. We will be starting our first session of conferences promptly at 2 pm so please be on time to pick up your child. If you are late, your child will be waiting for you at the office.